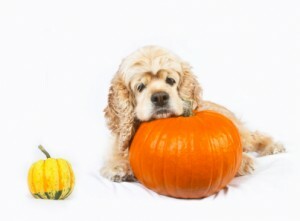 Turn your leftover Halloween pumpkin into dog treats! Wondering what to do with your Halloween pumpkin after all the fun is over? According to the clever folks at my favorite dog magazine, The Bark, pumpkin puree has a soothing effect on upset dog tummies. Who knew? Here are directions for saving that pumpkin, just in case. 1. Preheat the oven to 350° degrees F.
2. Cut your jack-o-lantern into large wedges. Place the wedges skin side up on a lightly oiled baking sheet. Bake for approximately 90 minutes, or until the pumpkin wedges are fork tender. 3. When the pumpkin is cool enough to handle, scoop the flesh out of the skin into a bowl, then mash it or whirl it in a food processor. If the purée is a bit watery, cook in a saucepan over medium heat until some of the moisture has evaporated. 4. Let cool, then portion into freezer bags or containers and freeze. The purée can be defrosted quickly in the microwave or by placing the frozen bag or container into a bowl of hot (but not boiling) water. Use by itself to help with canine constipation or diarrhea (check with your vet for the amount appropriate for your dog), or use it in your favorite recipe for dog treats! 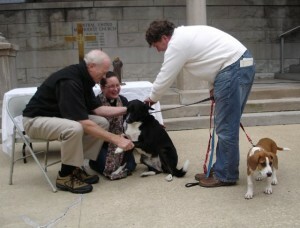 This past Sunday, Alex and I participated in a Blessing of the Animals service at my church. It was a joyful and moving moment as each pet approached the altar to receive the minister’s blessing. The procession included golden retrievers, border collies, an English Shepherd, a westie in a jaunty orange bandanna, a PBGV, and of course Alex the Welsh Springer. A hamster and a cat also received the blessing. The animals seemed to sense that this was a special moment, and all were quiet and well-behaved as the minister made the sign of the cross on each forehead. After all the animals had been blessed, a woman come forward with a photo of her pet. She joined hands with the minister, and they bowed their heads in prayer, perhaps for a beloved pet who had passed on, or was too infirm to attend. 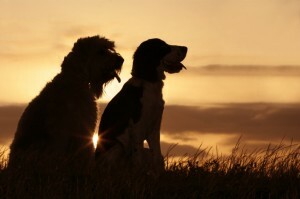 I left filled with thankfulness for the blessings that pets bestow on us each day of their lives.